Despite all odds, ART Grand Prix ends the 2013 season on a high, with the vice championship crown in the World KF Championship thanks to Ben Hanley’s superb drive. 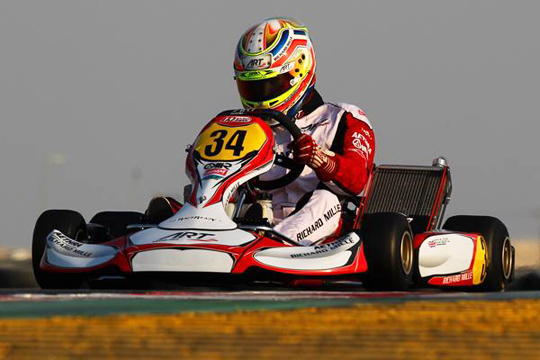 The weekend in Bahrain proved quite challenging, with several twists that allowed the experienced British driver to jump on the second step of the podium in the overall standings. A bitter-sweet result considering that Ben ended tied on points with the World Champion and missed on the title for having finished 3rd in the first round and 4th in Bahrain. A string of difficult results in the heats following a mid grid starting position (Ben’s fastest lap in qualifying was disregarded after he crossed the white line), and some bad luck in prefinal - in which the Brit found a lot of traffic due to an accident at the beginning that prevented him to make up more positions despite four new tyres - finishing only 15th from 19th on grid, hindered his chances of a better final result. Too bad, because the ART Grand Prix factory driver showed a great pace in both prefinal and final, and could take advantage of Verstappen and Nielsen’s crash on lap 7, the two that preceded him in the championship standings after round 1. Behind Hanley at the flag, Tuomas Tujula was protagonist of a massive comeback from 28th on starting grid to 5th place in the final. In the KF Junior World Championship, the ART Grand Prix boys gave everything they had to pair Hanley’s performance in the senior category. After a difficult qualifying session and some top-ten results in the heats, only Sergio Sette Camara, Olli Peltola and Amary Bonduel managed to make it to the final, where all three made up several positions showing the high quality performance of the equipment. “We can’t be entirely happy with the result. Finishing with the vice championship title is almost a defeat after the way things were going in the final. With the top two drivers of the standings out of contention, it seems such a waste to have managed to finish only 4th tied on points with the final winner. But we did the most we could, Ben turned a complicated weekend into yet another trophy for ART Grand Prix, and also Tujula proved to be very fast in the final.